Endothelial progenitor cells (EPCs) are unique stem cells in circulating blood. Studies showed strong beneficial evidence using EPC therapy in experimental animal models and clinical trials. In this review, we discussed the characteristics of EPCs in the stroke therapy. We summarized the effect of EPCs on the treatment of cerebrovascular diseases including ischemic and hemorrhagic stroke, moyamoya disease, and vascular tumor, etc. Although the molecular mechanisms of EPC therapy are not fully understood, the function of EPCs included releasing growth factors, regulating microenvironment in the injury territory, and maintaining blood-brain barrier integrity. Clinical application of stem cell-based therapy is still in its infancy. 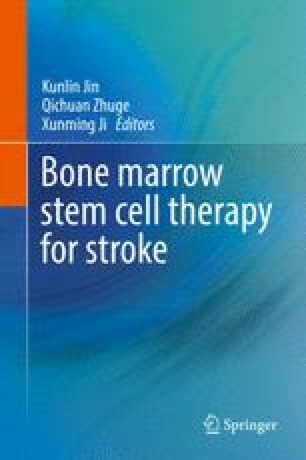 The next decade of EPC research in the stroke field needs to focus on the studying the molecular mechanism or combining other type stem cells to enhance the potential of this therapeutic avenue, and translate to clinical application. This study was supported by research grants from the National Natural Science Foundation of China (#81471178 and #U1232205 GYY), the Science and Technology Commission of Shanghai Municipality (#13ZR1422600 ZJZ), and KC Wong Foundation (GYY).